It is also known as a blood purifier. 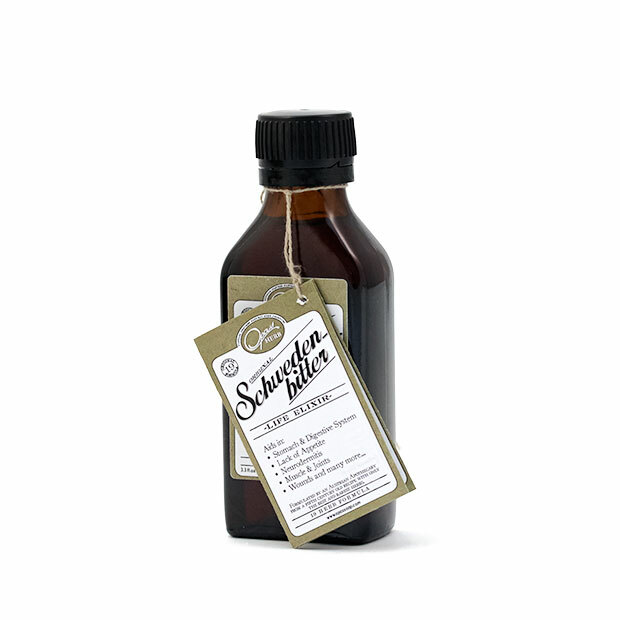 Most Swedish Bitters on the market today use an 11 Herb formula. We decided to use the original Austrian Apothecary 19 herb formula; it is based on the Big (Grossen) Swedish Bitter. With travels to Austria and research we speculate the Grossen Schwedenbitter to be closer to the original Paracelsus recipes that got lost. We receive many questions on how one can use bitters. Bitters can be used for a variety of complaints including digestive complaints due to the bitter herbs contained therein. Bitter substances have almost been completely eliminated from the modern diet. This can cause an imbalance as bitter substances have the ability to improve kidney and liver function, improve bile, reduce bloating and flatulence, improve metabolism, and prevent acidification of the body. So, if your digestive system is at risk, Swedish Bitter may rid your complaints. Other personal uses in our family We've used Swedish Bitter for a number of personal complaints including; toothaches, food poisoning, cuts, burns, allergic reactions, muscle aches, cramps, headaches, digestion, pimples, scars, and rash. Awesome product especially with the 19 herb formula!! Also was impressed with the shipping time to New Zealand!! First time I took a teaspoon in water I could feel things happening throughout my body. Amazing! It came quick. I have used it before it's great stuff ! !should be in everyones firstaid kit. Excellent Bitters! Mercedes is a sweetheart! Thanks for all your kind convos! I’m very, very, thankful for this product. Due to my neuropathy in all 4 limbs I spend much of my time in wheel chairs and hospital beds. Thus I’m prone to getting sores or bedsores. Which makes my sleeping (lying in bed) a burden, waking up about every hour to move. After having 5 sores and having tried many products, this one REALLY WORKED and I noticed after one day of applying it (to my wounds) and waking up, I had some healing! Oh what a relief it’s been to see my wounds slowly heal everyday and now NOT waking up every hour in pain. I’ve also decided to try it with my other health infirmities and it helped with my phlegm in throat, rashes on skin, other aches (bruises) and pains. I will be ordering more for me to try internally and for my friends and family. Every hospital, nursing home, and especially every home should have this on supply. This is my first try of bitters & i am looking forward to better health. So happy i found this old remedy on here. Great product. Excellent (though it is VERY bitter) - I get severe headaches and tried this the other day for a migraine that was starting in the back of my head/neck - this actually helped tremendously. Thank you! I had a major tooth ache that ended up needing a root canal. My dentist didn't do root canals, so I had to go another night with intense pain before I could see an endodontist. Vicoden, didn't work. Ambesol worked a little bit, but for a very short period of time. A friend at work brought over a cotton ball with a few drops of a brown smelly liquid on it and told me to trust him. I was in enough pain to try anything. He had me gently chew on the cotton ball. It tasted bitter, and nasty, but not so nasty I didn't get use to it. Best of all though, it made the pain go away. I ended up gently chewing the cotton ball like gum, here and there adding a new drop, all the way up to my appointment with the endodontist. I now keep my own bottle.